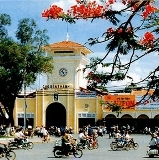 Throughout history the Mekong Delta region of Vietnam has played a vital role in the country's life. The varied and rich cultures and traditional lifestyles of the citizens of the area have been maintained over the years. Mekong Delta Discovery will introduce you to the colorful and history-rich southern area of Vietnam. We begin our adventure at Ho Chi Minh City and spend three leisurely days wondering the waterways of the Delta. Here, we will visit floating markets and rural villages and experience the age-old traditions and lifestyles. As we make our way from Ho Chi Minh City, we will stop at Cai Be for a shopping adventure on a floating market and visits to hidden scenic islands in the Mekong Delta. A perfect way to introduce you to this gorgeous area of Vietnam. A breakfast cruise starts off your day before we return to Can Tho for lunch and a drive to Chau Doc. Along the way we will have time to visit the small town of Long Thanh whose fame rests upon the exquisite handcrafted baskets and other treasures fashioned by local artisans. We continue our floating adventure with visits to Embark, Chau Giang District,'Khmer Temple' as well as a floating fish farm. Next we visit the Cham town of Chau Doc. The Cham people are an indigenous people of Cambodia and Vietnam who have lived in this area for centuries have significantly preserved their traditions and lifestyles.They are world-renowned for their fashioning of silk and other textiles. We end our day atop Sam Mountain for a glorious and romantic sunset. After breakfast this morning, we head back to Ho Chi Minh City and plan to arrive by mid-afternoon. AWS Tours offers you the exciting option to cruise to Cambodia from Chau Doc. Our expert guides can advise you about this option. Don't hesitate to inquire. Our expert travel team has planned your trip so that you can experience the very best of what Vietnam has to offer. We understand that many will have various needs and wants for each particular tour that may not be included in an itinerary. We will plan any tour to meet your particular demands. Please Contact US.